Ned, Murph, Sam, Enoch, Daphney, William, Hannah and Jupe. These are the names of some of the 17 slaves John Blackford owned at the Ferry Hill Plantation near Sharpsburg in the 1800s, Paula Reed told the audience Sunday during a Black History Month program at the Robert W. Johnson Community Center in Hagerstown. Ned and Jupe ran the rope ferry across the Potomac River, to what was then Virginia, for Blackford, said Reed, a historic-preservation consultant with Paula S. Reed and Associates in Hagerstown. “They were basically bookkeepers. Not only did they run the boat back and forth across the river, they collected the tolls. They kept track of … how many rides there were, how much business was done, and they turned in the receipts — the money, and the accounting every week to John Blackford,” Reed said. Ned and Jupe were apparently educated, or at least able to count, Reed said. Whether Blackford educated them is not known, Reed said. One of Blackford’s 1830 diary entries refers to giving Daphney “a pretty severe flogging for her impudence,” according to Reed’s presentation. Among Daphney’s acts of defiance in 1838 was to abort her unborn twins four months into her pregnancy, according to research Reed presented. The program, the beginning of which focused on slavery, was part of a series of Black History Month events the Contemporary School of the Arts & Gallery and the community center are presenting on Sundays this month at the 109 W. North Ave. community center. Reed presented findings from Blackford’s diary, as well as census data about the slave population in Washington County. There were 1,286 slaves in the county in 1790, representing about 9 percent of the county population, Reed said. That year, there were 64 free “colored” people in the county, according to the census. The slave population grew to 3,201 slaves in 1820, before decreasing to 1,435 slaves in 1860, according to census data Reed presented. The number of free blacks grew substantially during that period, from 627 in 1820 to 1,677 in 1860, Reed said. 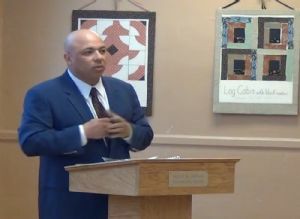 Brian Robinson, a historian with the African American Historical Association of Western Maryland, talked about the different lives of two slaves in the county who later became ministers. James W.C. Pennington was a slave on the Rockland plantation near Sharpsburg, while Thomas W. Henry was a slave at the Barnes plantation in the Clear Spring area and worked at Antietam Ironworks, Robinson said. Robinson said Henry was freed at age 21. Pennington, tired of the cruel punishment at Rockland, escaped from slavery in the late 1820s. Henry established Ebenezer African Methodist Episcopal Church on Bethel Street in Hagerstown, Robinson said. The program also was scheduled to include a presentation by Rebecca Massie Lane, director of the Washington County Museum of Fine Arts. Lawrence originally painted the series about the abolitionist in oil on cardboard, Lane said. Because cardboard was fragile, the Detroit Institute of Art issued 60 limited-edition prints of each of the 22 original paintings, she said. Janet Bartels and her late husband, Gordon, donated their print of No. 13 to the museum, Lane said. The print is not currently on display at the museum.